The speaker for this evening will be Prof John Bally from the CU Boulder, (john.bally@colorado.edu). New observations with ALMA, CARMA, adaptive optics, and space-based observatories are changing our understanding of star and planet formation. He will use multi-spectral images to zoom-in from the visual view of the Winter sky into the infrared to radio views of the star-forming cloud located immediately behind the Orion Nebula. About 550 years ago, a compact group of massive stars forming in this cloud experienced a violent explosion that released more energy than the Sun puts out in 10 million years. (Given the ~1300 year light travel time to Orion, the event actually occurred in AD 175±25 when Marcus Aurelius was emperor of Rome). 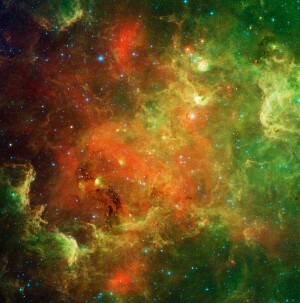 The explosion was triggered by a collision during a close-encounter of at least four stars. The 15 Solar mass merger-remnant (“I” in the Figure) and two other stars (“x”, and “BN”) were ejected with speeds of 10 to 55 km s-1 (arrows in the attached Figure). The event flung-out 5 to 10 Solar-masses of gas, traced by carbon monoxide and other molecules, with speeds up to 400 km s-1. As this ejecta rams surrounding gas, it powers shock waves seen in the near-infrared. Such interactions may be common in star forming regions, play a major role in determining the final masses of stars, and limit the sizes of their planet-forming disks. 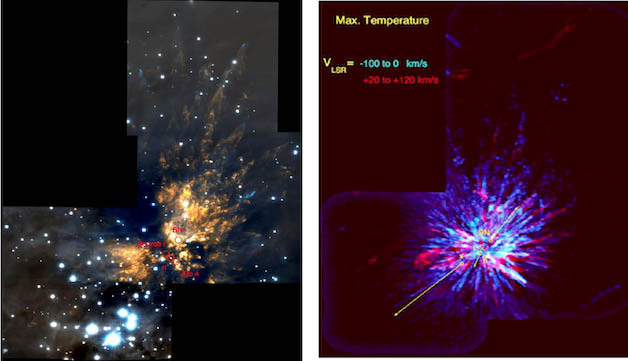 Figure 1: Left: A near-infrared view of the Orion explosion showing shock-waves traced by singly-ionized iron and hot molecular hydrogen. The Trapezium stars which light-up the Orion Nebula are located near the bottom. Right: An image showing streamers of ejected gas traced by 1.3 mm emission from carbon monoxide. Colors show the radial velocities measured by the Doppler effect. Vectors show the motions of the ejected stars along the plane-of the-sky. The lengths of the arrows correspond to the stellar motions over the next 2,000 years. He joined AT&T Bell Laboratories for 11 years as a Member of Technical Staff, working in the Radio Physics Research Department at Crawford Hill in Holmdel NJ in the group that discovered the Cosmic Microwave Background. He studied interstellar molecular clouds, the outflows and jets produced by forming stars, built sensitive mm-wave receivers, and worked on high-bandwidth, free- space optical communications, and atmospheric propagation characteristics. He participated in several expeditions to the South Pole in Antarctica to set-up the first permanent astronomical observatory there. selection” in which black holes produce universes. operates a small observatory used to take deep wide-field images. various celestial objects. Public star nights are held the third Friday of each month, except July, when we are closed for annual maintenance.